The following is taken from the Preface to a just-published collection of my blog posts from the past year. Research studies and media stories about lawyer depression, anxiety, substance abuse, and suicide are legion, but Prof. Austin’s Killing Them Softly sounded a new kind of alarm through its application of neuroscience to the chronic stresses of law school and legal practice and its depiction of how law students and lawyers suffer cognitive brain damage that impairs them from doing precisely what their studies and practices require. How’s that working for you, if you’re a client? Or an educator? Or a spouse? Or any number of other people with vested interests in law student and lawyer health and performance? If we know we’re hurting ourselves, then why don’t we stop it? I’d blogged before about the legal world’s confounding indifference to its own welfare. 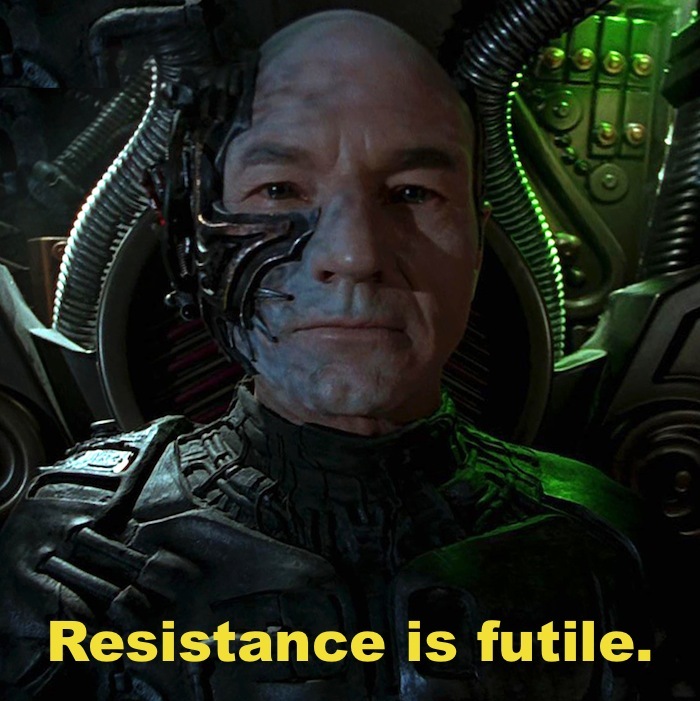 This time, I broached the topic in a short series called Saving Ourselves From Ourselves, using Star Trek’s bad guys The Borg to lighten the inquiry. I mean, it was the end of the year (2014) and holiday time, after all. My attempt at levity didn’t help. Not really. The topic was too disturbing and the Borg “you will be assimilated” metaphor too appropriate. The law profession’s entrenched willingness to tolerate and continue unhealthy and performance-impairing practices wasn’t going away that easily. Meanwhile, I’d noticed that an emerging subset of the legal profession seemed to be having a more upbeat experience. These were the new legal entrepreneurs, who seemed to have cornered the market on inspired action and were busy creating a bold new future for law practice. And yet, from what I could tell, the mainstream of lawyers remained unaware of the seismic shift in the legal profession happening right under their feet. They simply didn’t have ears to hear or eyes to see; they didn’t and apparently couldn’t feel the tremors. Once again I wondered: Why not? I had written about trends in law practice before as well, but armed with new research, I launched a new series at the start of the new year (2015) on The Future of Law. And then, for some reason I couldn’t articulate then and still can’t, I decided to play like a futurist and predict where the future of law was going. The predictions flowed easily once I focused on the larger trends driving the entrepreneurial initiatives, such as globalization, commoditization, democratization, and big data. Those trends were mostly finding expression in new legal practice models and technologies, and in hindsight my predictions in that arena frankly weren’t all that remarkable, although they certainly seemed so to me when I wrote them. No surprise, then, that one week I would predict something, only to discover within short order an example of it. No, I hadn’t developed a new gift of clairvoyance, I was only tapping into what was already happening. In fact, I was fast being left behind: not only were the legal entrepreneurs busy creating a new future for law practice, but both legal and popular media were equally busy covering it. I had just come late to the party. The new practice models and technologies wouldn’t only change how law is practiced, they would invariably re-create lawyers themselves — who they are, and what they do. As a result, a new kind of lawyer would engage in a new kind of law practice, alongside a new kind of legal expert who wouldn’t even qualify to be called a lawyer in today’s regulatory environment. Alongside both of them, consumers (no longer “clients”) would themselves also practice law in a wave of legal DIY aided by artificial intelligence algorithms engineered by cyber geeks and served up online. The combined impetus of all these developments would create a new kind of law— new in both substantive content and in how it is created, shaped, communicated, and applied. In particular, this new kind of law would be created and disseminated, and would grow and change, by processes other than the historical reliance on legislation and appellate precedent and lawyer-to-client communication. Finally, the advent of a new kind of law would transform the law’s role as a foundational institution in the larger cultural context in which it lives and moves and has its being. 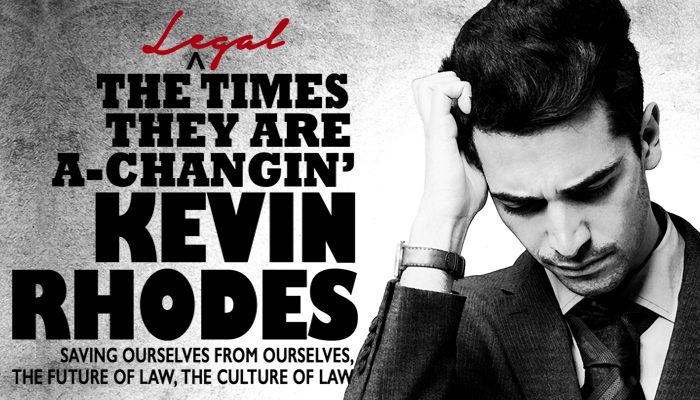 The Legal Times They Are A-Changin’ is the second collection of Kevin’s blog posts focuses on the future and culture of law, including insights on technology, innovation, neuro-culture, and entrepreneurship. Extensively researched, visionary, and written in a crisp, conversational style by a man on a mission to bring wellbeing to the people who learn, teach, and practice the law. Question: What do mindfulness and meditation, hackers, crowdfunding, a law school offering masters degrees for non-lawyers, and techno-speak all have in common? Answer #! : They’re all the future of law. Answer #2: And that future is already here. Mindfulness and Meditation must be all the rage when The Wall Street Journal features Lawyers Go Zen, With Few Objections. Check this trend out for yourself next week at the Better Lawyering Through Mindfulness Workshop with bankruptcy lawyer Jeena Cho, who’s quoted in the WSJ article and is on a national tour promoting her book The Anxious Lawyer: An 8-Week Guide to a Happier, Saner Law Practice Using Meditation. Hacker Law. Legalhackers.org proclaims, “We are explorers. We are doers. We are Legal Hackers.” Legal hacking, it says, is “a global movement of lawyers, policymakers, technologists, and academics who… spot issues and opportunities where technology can improve and inform the practice of law.” Here’s how one legal hacker pursues justice. And, in the interests of equal time, here’s a skeptic’s take on the topic. Crowdfunding Lawsuits. It’s not just about raising money to hire a lawyer, it’s about equal justice for all. CrowdJustice is on a mission to “make justice accessible.” “Sometimes petitions are not enough,” its website declares, “The law should be available to everyone, big and small. CrowdJustice gives you the tools to raise funds, mobilise your community and publicise your issue.” (Yes, they’re British.) LexShares is “revolutionizing access to the justice system” while giving you the chance to do well by doing good: you can “earn a return from litigation finance” by taking a piece of the judgment/settlement. “The new Master of Science in Legal Studies (MLS) is designed for those who want to improve their legal fluency in areas related to industry regulations, compliance, deal making and more without committing to three or four years of law school. ‘The goal is to provide legal literacy,’ Scott said. Pivoting and nimbleness are key entrepreneurial concepts, and Loyola takes them to heart: i.e., students can benefit from the kind of narrow mylaw.com focus they’ll be able to give their business clients of choice. And the best part is, they’ll learn without suffering the brain-numbing stresses of law school. Um… that’s a good thing, right? That bit of garble is from this ediscovery company’s website. Let new lawyers learn the litigation ropes by grinding through discovery? No. Call in the data pros instead. They have an office right here in Denver, as some of you know already. Okay, we get the point: anything we can possibly imagine about the future of law is already happening. Can we move on? Yes, of course. Our next series will take a fresh look at the culture of law. I tried to end this series three weeks ago, but the future keeps arriving, and I keep wanting to tell you about it. I realize that just because it’s news to me doesn’t mean it’s news, and this week’s topic is a case in point: it was analyzed in this law journal article three years ago. Use of data/trend analysis as a predictive legal decision making tool, made possible by technology’s ability to sort through massive amounts of data and find what’s relevant — i.e., to think like a lawyer, techno-style. The morphing of digital tools such as ediscovery and online due diligence from their case-specific beginnings into more widely accessible databases of searchable information. The creation of new law school legal training to promote the systems thinking the future of law requires. “We hear a lot of talk about “big data” and how it will drive law practice in the future. In theory, someday you will have every bit of relevant practice data at your fingertips and you will be able to use that to predict how a judge will rule on a case, have computers crunch through discovery, and realistically predict the cost of litigation. That someday is getting closer and closer, particularly with tools like Ravel. “Data analytics and technology has been used in many different fields to predict successful results. “Having conducted metrics-based research and advocacy while at the Bipartisan Policy Center, and observing how data-driven decision making was being used in areas like baseball and politics, [Ravel Law founder Daniel Lewis] was curious why the legal industry had fallen so far behind. Even though the legal field is often considered to be slow moving, there are currently over 11 million opinions in the U.S. judicial system with more than 350,000 new opinions issued per year. There is also a glut of secondary material that has appeared on the scene in the form of legal news sources, white papers, law blogs and more. Inspired by technology’s ability to harness and utilize vast amounts of information, Daniel founded Ravel Law to accommodate the dramatically growing world of legal information. “Ravel’s team of PhDs and technical advisors from Google, LinkedIn, and Facebook, has coded advanced search algorithms to determine what is relevant, thereby enhancing legal research’s effectiveness and efficiency. Ravel Law offers data visualization/mapping. For an article on why you should care, see this Above the Law article from a couple days ago. The “meta” of something is its higher abstraction, the bigger picture behind the smaller ones. In scholarship, a meta-analysis is an analysis of all the analyses of a topic. Each separate analysis collects and analyzes data. The meta-analysis analyzes all the analyses. Now that we’ve looked at various individual current trends and projected them into a vision of the future of law, what’s the meta of them? What’s the big picture? Our futurist approach has been mostly based on trend analysis: seeing what already is, then guessing where it’s going, meanwhile keeping in mind that we are not passive recipients of the future, but powerful agents of its creation. If we want to be, that is. If we make the effort. Some of us want to be, and will. People in this group will engage with the dynamics of change deliberately, consciously, intentionally, mindfully — taking action to shape current trends into the future they want. Some of us don’t want to be, and won’t. This group will be the change resistors, daring those responsible for disruptive innovation to prove that the trends represent change for the better as the resistors judge it to be. Regardless of our response, the future is ours, whether we choose to advance or resist it. All this will happen on countless individual stages, but what’s the big show that will play out on the biggest stage? What’s the meta of the future of law? The answer lies in the nature of the law itself. The law is itself a meta-reality — one of those gigantic, archetypal organizing principles of human life. The law enfolds and expresses our humanity, creates cultural and societal and national context. Those who live and work in the law are unavoidably its guardians and tutors, stewards and caretakers. We will create the law’s future, one way or another. When we create the law, we shape and guide our humanity. When we do that, we create our world. And most of all, we create ourselves. The law: our humanity, our world, ourselves. There’s a lot at stake here. May we craft the future with care. The Future of Law (19): Don’t wait, create! “We are still the masters of our fate. Rational thinking, even assisted by any conceivable electronic computers, cannot predict the future. All it can do is to map out the probability space as it appears at the present and which will be different tomorrow when one of the infinity of possible states will have materialized. Technological and social inventions are broadening this probability space all the time; it is now incomparably larger than it was before the industrial revolution—for good or for evil. I.e., we can speculate — as we’ve been doing in this series — about where present trends might take us, but it’s useful to remember that “we are still the masters of our fate.” We can shape where those trends take us by engaging with them, and thus we can invent the future — the future we want, not just the one that will happen to us. Pick one of the predictions I’ve made. Go ahead, we’ll wait. Is there one in particular that has a lot of energy for you, so that when you read it you say, “Oh yeah!” Or if there are several, is there a theme that runs across them? Don’t over-think – just go where you feel a tug – the stronger the better. Express it as a goal or intention — something you are committed to making happen. Complete this sentence, filling in the blank: “My response to this prediction is to create ________________.” Maybe it’s a career or practice shift, or something personal. It doesn’t matter what your goal is. What matters is your commitment to it. Beatify it. Yes, you read that right. No, we’re not making anyone a saint here, we’re using “beatify” in the sense of “extreme blissful happiness.” Yes, you read that right, too. What we’re after here is to take your goal/intention and take it to an extreme level of emotional reward/satisfaction. What would creating it give you that you don’t have now and would really like to have? How would it revolutionize you, your career? Watch where your thoughts go with this. What ideas and feelings come up?. Be prepared to write fast and take good notes — the energy of the idea that grabbed you plus your commitment to it will pop the cork on your creativity. Welcome to the future — the one you’re creating. Author Kevin RhodesPosted on May 20, 2015 May 20, 2015 Categories The Future of LawTags create the future, Dennis Gabor, invent the future, Inventing the Future, mindfulness, mindfulness in law, mindfulness in law practice, The Future of Law, the mindful lawyer, trend analysis, trends, Trends in law3 Comments on The Future of Law (19): Don’t wait, create!